This says it all. 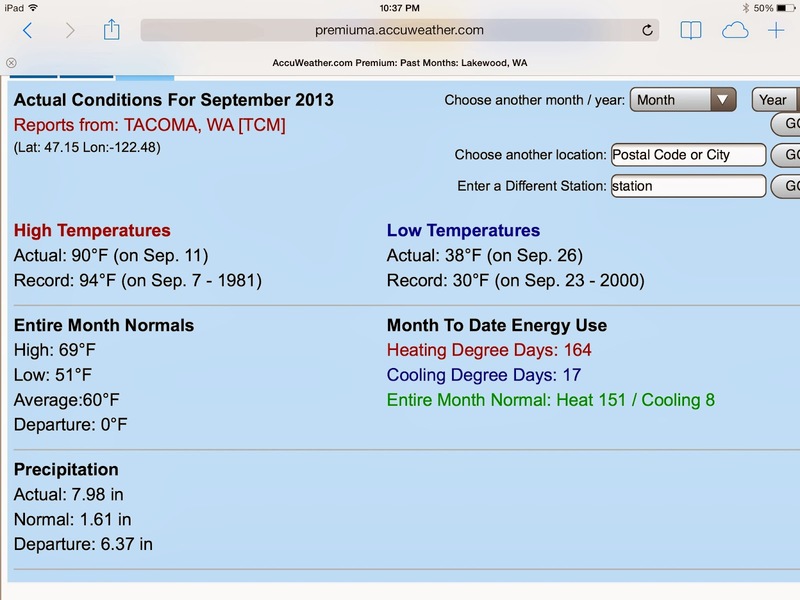 Nearly 8 inches of rain this month and it really didn't start raining till the 17th. That's almost 6.5 inches above normal for the month, so let's just say, it poured!.. This really messed up my plan to punch the greens a second time with that small 1/4" tine. When your plans depend on the cooperation of mother nature, you simply win some and you loose some, because Ms. Nature likes to keep you on your toes. In this case, she beat me with my experimental aerification strategy, but I am definately winning the battle of me versus wet conditions. Check out some of these pics from the record rain events of September 2013. Above you see 12 greenside bunker washed out again. All together I think the bunkers were washed out 3 times. It takes a little work to shovel the sand back in place but the reality is we have some really awesome bunkers given we installed the sod liner during initial construction. The liner is performing beyond my expectations. 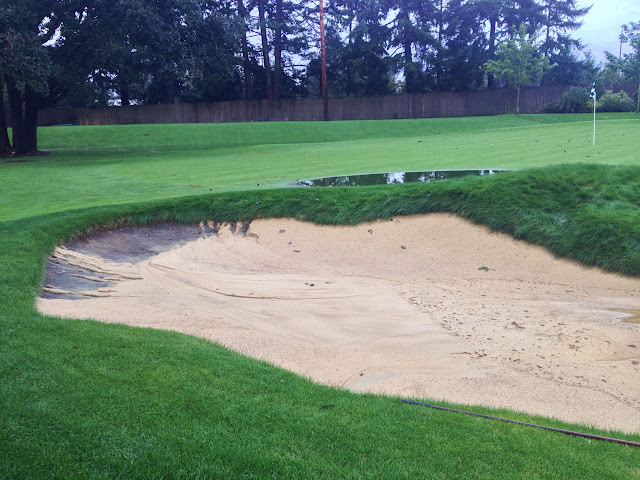 The sand is simply washed out, but the only thing washing out is bunker sand. The liner is keeping the native soil and rocks in place and the bunker sand remains completely clean and free of contamination. I JUST LOVE IT!!! 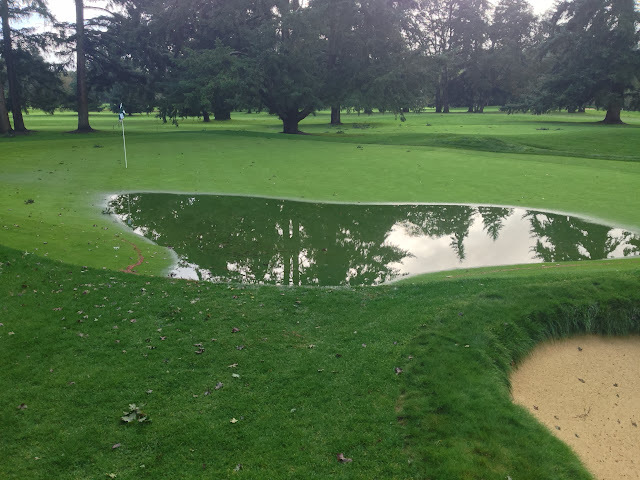 Mother nature can't ruin our bunkers now. 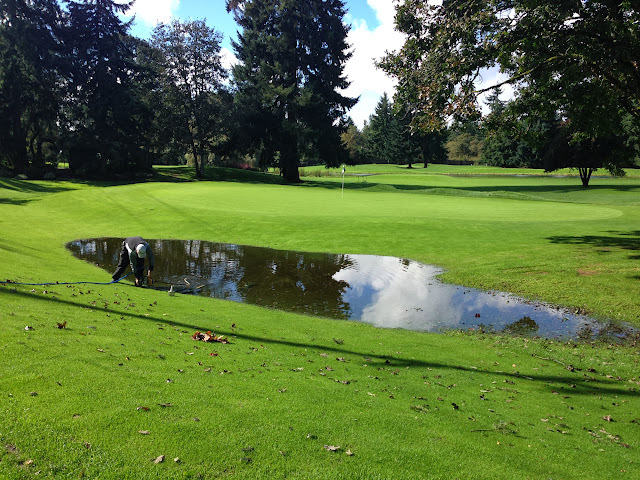 This puddle on #7 was impressive. 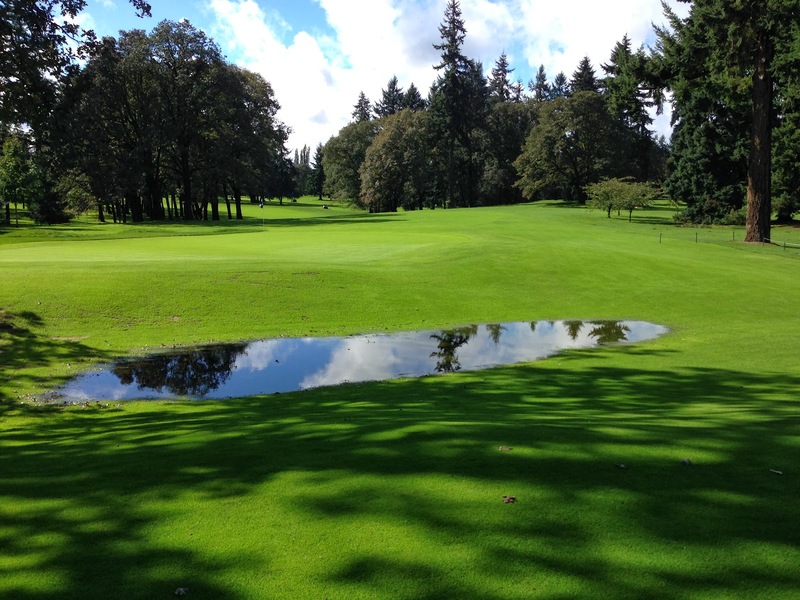 This puddle was between 5 and 8 green. It's no surprise that this area is holding water. 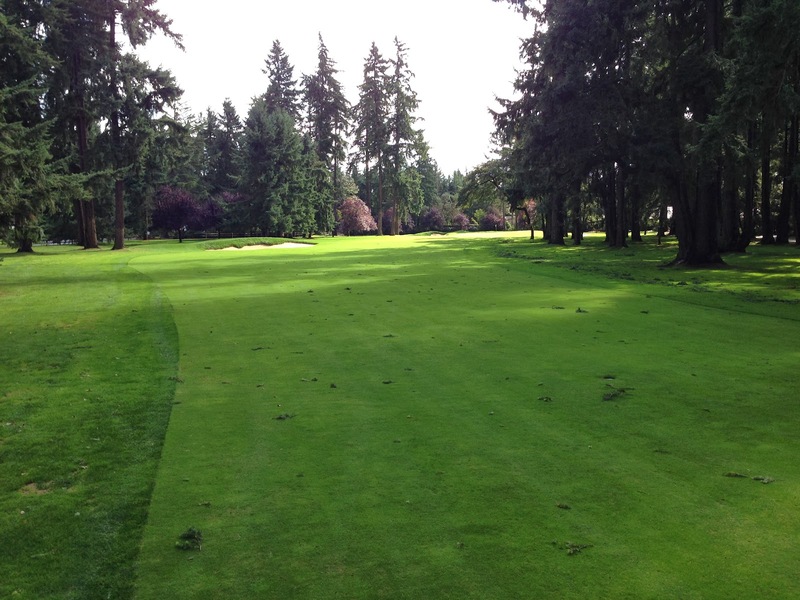 Since it was always roughs before the renovation, it hasn't been on the top of our priority list. Well right now it is fine turf and this new short mowed area is one of our favorites. This area will be on the top of our list now. Standing water here will soon be a thing of the past. The area left of 12 is again one of those new short mowed collections areas and given it is brand new, it's not surprising that it doesn't drain well. I say that because it you look at all our typical wet areas, you will notice they aren't wet anymore. Why???????? One word....................Vertidrain! 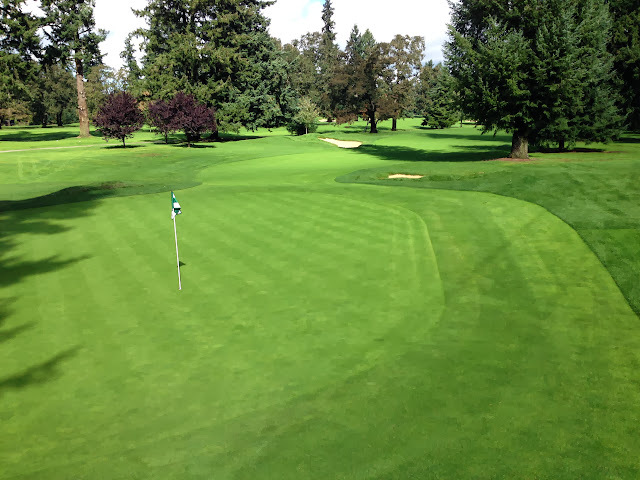 Our new deep tine aerifier has corrected the drainage on nearly every one of our historically wet areas. ........Observe. Above you see #2 fairway last week after receiving 8 inches of rain in the 13 days prior. 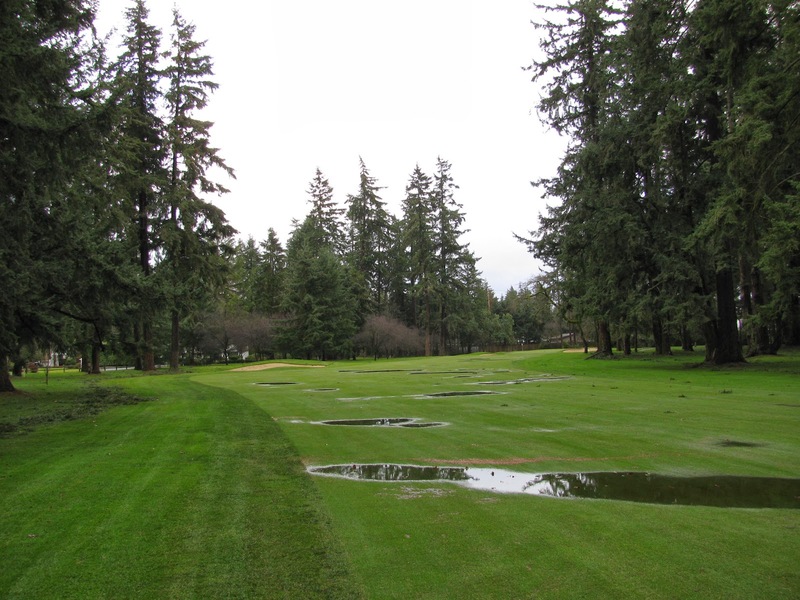 Here's #2 fairway a couple years ago following a rain event less severe that the one we just had this past month. How cool is that?? 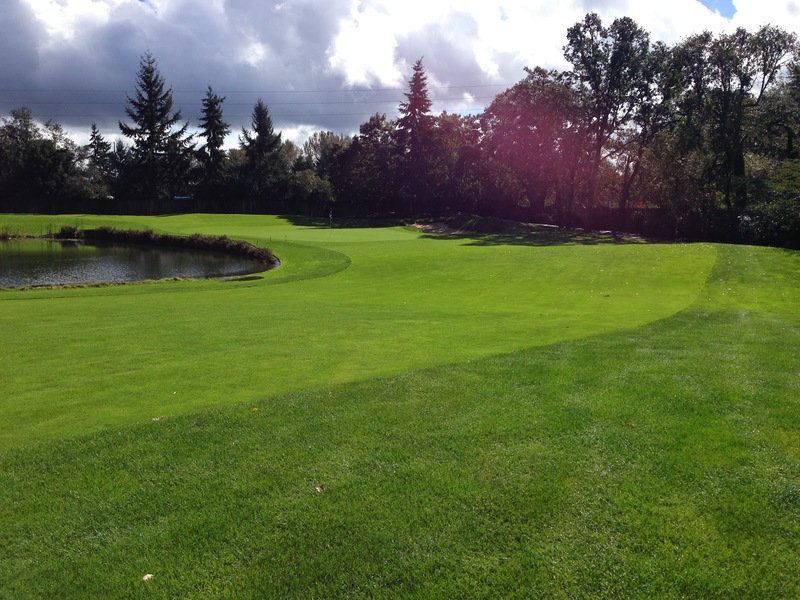 Here's a picture of 15 fairway taken a couple days ago. I'm sure you remember that swale holding water for several days following a heavy rain. I'm not sure we will ever see standing water there again thanks to Mr. Vertidrain. And look at the swale in front of #5. Again, this picture was taken a couple days ago after receiving that 8 inch deluge. In the past, following large rain events, we would have ducks swimming in a small pond fronting this green. (by the way......I hate ducks). Yes...........I have said it before and I will say it again, the Vertidrain and Kioti tractor purchase was probably the best money we have ever spent. The golf course is not what it used to be. We are currently still able to mow every square inch of the property. Hope you get a chance to come out and enjoy it.